You can select up to 2 travelers in total. Make the most of your visit to the Seychelles. 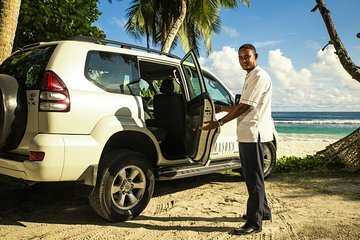 Instead of piecing together transport, book a tailor-made, full-day tour of Mahe island. After hotel pickup, visit the capital of Victoria to see government buildings, a museum, the clock tower, and more before heading to Albert Street and market stalls piled high with fresh fish, fruits and vegetables, and spices. Next, drive across the Sans Soucis mountain pass with a stop at Mission Lodge. After lunch continue around the southern tip of the island.